There may come a time where you will need an object to wrap around the frame. This tutorial teaches you how to create such an effect by explaining the underlying core mechanics behind such a system and by providing example files. The image to the left shows an example of creating such an effect using built-in system events following the. This effect, however, is choppy visually. The example file visually demonstrates this choppiness. Specifically, half of the object is still visible in the frame when the object wraps around. Likewise, when the object wraps around, half of the object is outside the frame. This can be improved upon by creating a custom wrap-around effect, described in the rest of this tutorial. Similar to before, we will need to detect when an object leaves the frame in a specific direction. We can detect when an object leaves the frame on the left side by comparing the x-coordinate of the right side of the object against the x-coordinate of the leftmost visible pixel. This condition is show in line 2 in the above picture. It is important that the equality sign is "less than" and not "less than or equal to." This is important because when we move the object, the object will be placed exactly at the boundary lines. Having a "less than or equal to" sign would continuously trigger the condition after the first wrap occurs. When this condition triggers, we want to place the left side of the object at the frame's rightmost visible pixel. This is a simple as placing the x left coordinate of the object at the rightmost frame pixel. Once this is completed, you easily extend this principle to the other three sides of the frame, as shown in lines 3, 6, and 7 of the above image. The hot spot of these actives are in the center of the object. As such, the formulas must account for the offsets. Specifically, the expressions add or subtract half the object's width or height. This ensures the object is placed exactly at the frame's edge. Once all of this is completed, the custom wrap-around effect is completed! You may need to fine tweak the values to perfect the positions of the object, but the core mechanic is fully completed. 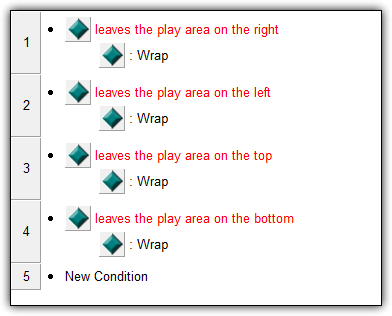 When you test the code, the object wrap should look much more smoothly as opposed to when using the system wrap. The next thing you can do is explore the example MFA File and Tutorial PDF located under the "Download" section at the top of the page. 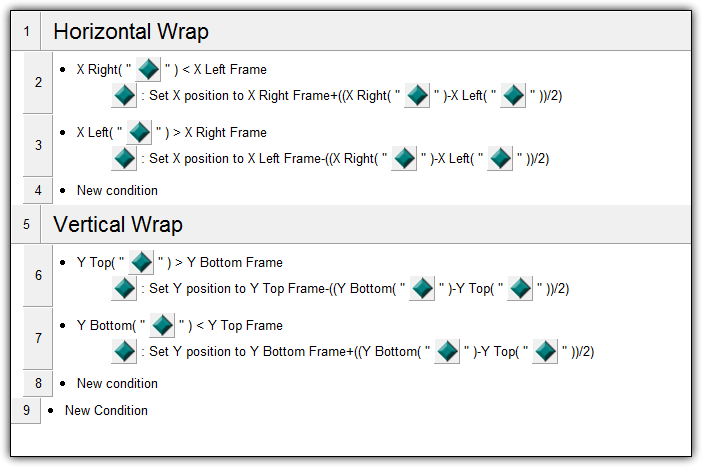 The example MFA File provides the built-in and custom method of wrapping. From there, you can breakdown each event and adjust them as you see fit!